Last month, the Migos member Offset released his debut solo album Father Of 4. It was a big deal, but not a huge deal. And yet Ellen DeGeneres basically devoted an entire show to Offset today. She gave him the full-court press. Not that long ago, all the Migos dudes were known for being difficult interviews. But Offset been getting media training — or maybe he’s just grown more comfortable in the spotlight — since he managed to be relaxed and charming on Ellen. Sitting down with Ellen, Offset talked about a whole lot of stuff in a relatively brief interview: The giant wads of cash he walks around with, the time Ellen helped him buy a Bentley truck, the life-threatening car crash that inspired his song “Red Room,” his estranged relationship with his own father. Offset also talked about the time that, when he and Cardi B were separated, he attempted to apologize to her onstage during her own festival set, chalking the whole thing up to men’s struggle to be publicly vulnerable. And then he had one of his kids present a giant novelty check for Ellen’s charity. This guy’s really working it! And he rapped. 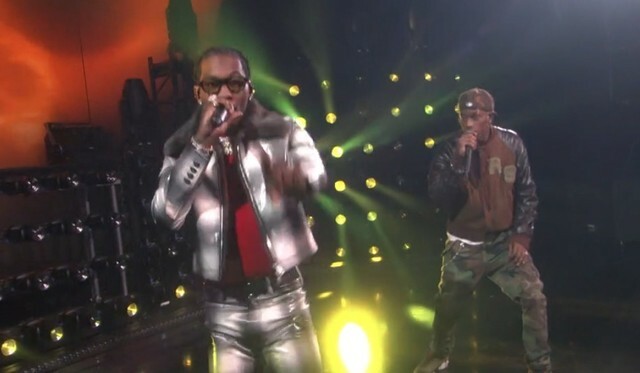 Together with Travis Scott — who did not show up with Schoolboy Q on The Tonight Show earlier this week to perform a different collab — Offset did the Father Of 4 track “Legacy.” It seemed to make the Ellen crowd happy. Watch the interviews and the performance below. Father Of 4 is out now on Quality Control/Motown/Capitol.